VFJ8500, the latest and most advanced model of VFJ NC Series, is the fastest fitness sorter in the group. 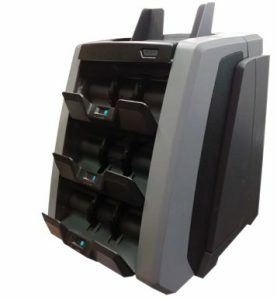 Comes with enhanced and reliable authentication / fitness detection, with easy modes switching to fulfill all kind of process needed when banknote handling, with capability to improve cash management efficiency by recycling the banknotes in branch and reduce workload with high accuracy and productivity. It detects holes, tears, folded or missing corners, tape, stain and soils of banknotes, the all-in-one design makes all the tedious operations in a snap. Built with wide range counterfeit detection capabilities, VFJ8500 stops counterfeits by using the most advanced counterfeit detection technology in the industry. VFJ8500 is a compact and cost-effective 3-pocket sorter that is designed and developed to meet with the growing demand for more efficient cash management at branches. Counterfeit Detection: Dual CIS, Infrared reflection and transmission, Magnetic, Thickness Sensor, Ultraviolet. Serial number count 1100 notes/min. Available Currencies: USD, EUR, GBP, LOCAL (OPTION), Up to 12.